The Nigerian Egusi soup, prepared with melon seeds, is the most loved soup for Nigerian Fufu meals in Nigeria. Foreigners love it because it is our soup that looks, feels and tastes most like a foreign sauce. 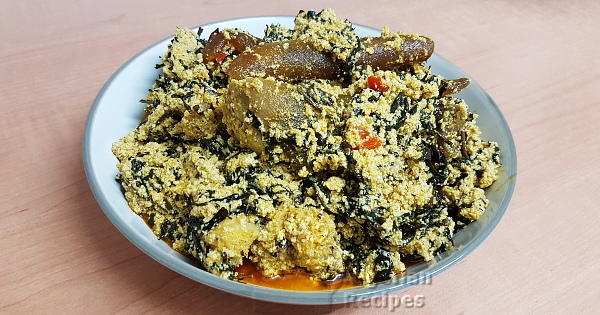 Unfortunately there are those of us who do not like Egusi Soup for several different reasons. For some people it is the way the soup looks, for some it is because it gives them heartburn and for some it is because of the way it tastes. It is the "sweetest" of all Nigerian soups for swallows and those that do not have a sweet tooth do not like it because of that taste. On this page, I will share how I prepare Egusi Soup so that I can enjoy it. This involves tweaking the usual recipe so please pay attention when reading this recipe and when watching the video below. I include lots of information in the notes about the ingredients section. I usually add enough red palm oil to colour the soup without the oil floating in the soup. The should should be yellow when done not red. See video below. I use Igbo-style washed and squeezed bitter leaves. The bitter leaves were slightly wilted in the sun then washed and squeezed several times till all the bitterness is gone. Habanero or Scotch bonnet pepper is atarodo, atarugu or ose oyibo. 1 disc of Ogiri Okpei should be enough. I don't use chicken nor fresh fish when preparing Egusi Soup. Grind the egusi seeds and the ogiri okpei with a spice grinder. Cook the shaki, goat meat, ponmo and stockfish with the seasoning cubes till done. I usually cook these with my pressure cooker. See video below. Because Igbo-style washed bitter leaves usually have long strands, cut into smaller pieces. Grind the crayfish if not yet ground. Chop or pound the pepper. When the meat and stockfish are done, remove them from the stock (water used in cooking the meat and fish) and place in a different pot or plate. Debone the stockfish and break into medium pieces. Decant the stock into a big enough pot. Add the ground crayfish and egusi to the stock and stir. If the stock from cooking your meat and fish is not enough to give you a medium consistency, add some water to get a medium consistency. See video below. Cover and start cooking on low to medium heat. Keep a close eye on it and once the egusi cakes, stir and add a little bit more water. watch it closely so that it does not burn. Repeat step 4, adding only a small quantity of water at a time. After about 20 minutes, you will notice the clear egusi oil coming to the surface of the soup. Add and bitter leaves and red palm oil, stir, cover and continue cooking for 10 more minutes, stirring it often. The soup should be yellow when ready. This shows that the red palm oil has completely integrated in the soup. Add the pepper then the cooked meat and fish. Stir and add salt only if necessary. Egusi Soup can get salty very easily. Cover and cook till it boils again then turn off the heat.